Garage door industry magazine for garage door dealers, garage door manufacturers, garage door distributors, garage door installers, loading docks, garage door operators and openers, gates, and tools for the door industry. National Door Industries, Inc. 6310 Airport Frwy., Fort Worth, Texas 76117 Proudly Made in USA www.natdoor.com • For more information: (800) 628-3667 • (817) 834-7300 National Door is the largest lube supplier to the garage door industry! 100 – Glass Cleaner (NEW) 200 – Citrus Degreaser (NEW) 400 – Best Multi-purpose lube in the industry 600 – Moli-Lube 800 – Food Grade (NEW) 900 – "Aero" Lubri-Spray 1000 – Med. 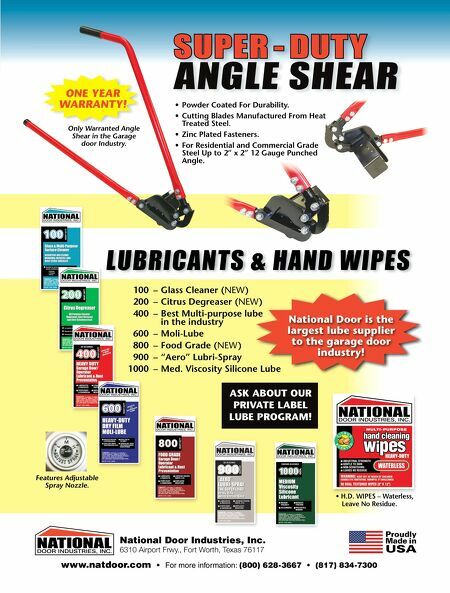 Viscosity Silicone Lube LUBRICANTS & HAND WIPES ASK ABOUT OUR PRIVATE LABEL LUBE PROGRAM! Powder Coated For Durability. • Cutting Blades Manufactured From Heat • Treated Steel. Zinc Plated Fasteners. • For Residential and Commercial Grade • Steel Up to 2" x 2" 12 Gauge Punched Angle. SUPER - DUT Y ANGLE SHEAR • H.D. WIPES – Waterless, Leave No Residue. Only Warranted Angle Shear in the Garage door Industry. Features Adjustable Spray Nozzle. W ONE YEAR WARRANTY!